Coin-Toss Fact-Check: No, Coin Flips Did Not Win Iowa For Hillary Clinton Clinton beat Bernie Sanders by a razor-thin margin Monday night in Iowa. Some have attributed her win to an improbable lucky streak of coin tosses. Yes, coin tosses. But that's not the whole story. Democratic presidential candidate Hillary Clinton speaks during a caucus night rally at Drake University in Des Moines on Monday night. Hillary Clinton got lucky Monday night. Very lucky. But not for the reasons some are alleging. 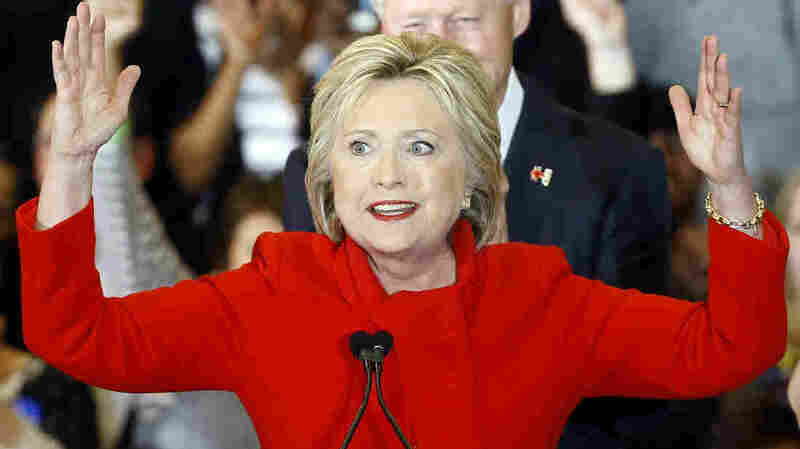 Some have attributed her squeaker of a victory over Bernie Sanders in the Iowa Democratic presidential caucuses to an improbable lucky streak of tiebreaking coin tosses. It's been reported that there were as many as six sites where ties were decided by the flip of a coin — and Clinton won every single one. The odds of that happening are 1 in 64, or less than 2 percent. What's more, that gave her just slightly more than her margin of victory over Sanders — four delegates. Things that make you go hmm. Indeed. Except that doesn't tell the whole story. In fact, there were at least a dozen tiebreakers — and "Sen. Sanders won at least a handful," an Iowa Democratic Party official told NPR. Gone unmentioned so far is that even if Clinton won that Miracle Six — and there were no other coin tosses — it would make little difference in the outcome. That is, in part, because of the complicated way Iowa Democrats allocate their delegates — and what was being reported on election night and what wasn't. Let's step back and explain that for a second; and this is tricky, so stay with us. First, understand that the state party reported a grand total of 171,508 caucusgoers, the second-highest turnout in Iowa caucus history behind 2008. And no raw vote was — or is ever — broken out by candidate and recorded at the Democratic caucuses. That's because in Iowa, it's a delegate game. 1. 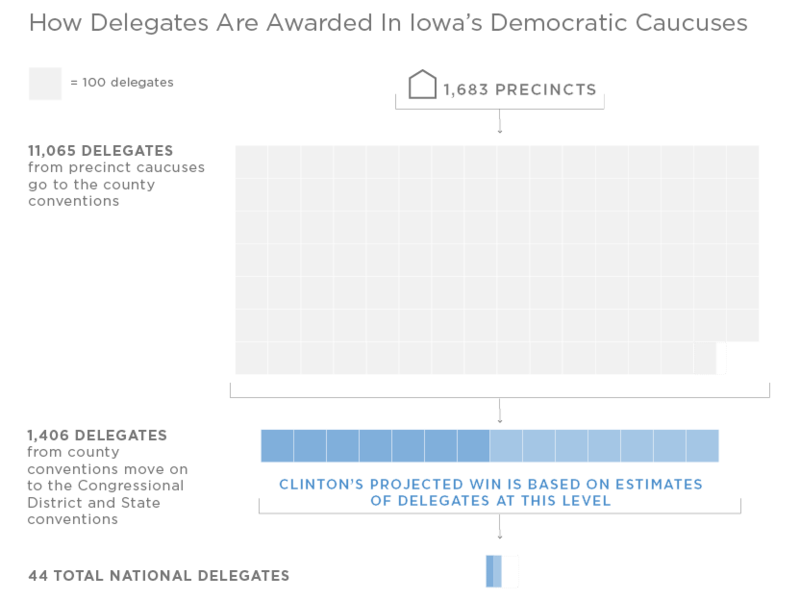 There were 1,683 precinct caucuses on Iowa caucus night. 2. Those precinct caucuses elected 11,065 delegates to the county conventions, which take place March 12. 3. That universe of 11,065 delegates is whittled down to 1,406 who will attend congressional district (April 30) and state conventions (June 18). 4. And here's the root of what's causing all the confusion: The breakdown of those 11,065 is not reported on caucus night. 5. What IS reported, what Clinton's 49.9 to 49.6 percent tracing-paper-thin lead is based on, is "state delegate equivalents." 6. Those are ESTIMATES of how many of those 11,065 will attend the congressional district and state conventions. So ... when those coin tosses are happening, they are elected delegates in that larger universe. That means, for Clinton to have picked up the four delegates, she would have had to have won not six in a row, but more like 47. Yes, Iowa — and it's not alone — uses coin tosses to break ties in precincts that award an odd number of delegates. For example: Let's say five delegates are set to be awarded in Precinct 1. There are 30 people for Clinton and 30 people for Sanders — and no one on either side can be swayed. The result: Clinton and Sanders get two delegates apiece. What happens to the final delegate? The caucuses revert to, you guessed, it, a coin toss. It's pretty rare in a normal race, but this was no normal race. Clinton and Sanders were separated by a razor-thin 0.3 percentage point, or four "state delegate equivalents" — 701 for Clinton, 697 for Sanders and eight for Martin O'Malley. It was the closest result in 40 years of the Iowa Democratic caucus. What was that about 60 missing caucusgoers and a coin flip? "Unable to account for that numerical discrepancy and the orphan delegate it produced, the Sanders campaign challenged the results and precinct leaders called a Democratic Party hot line set up to advise on such situations. "Party officials recommended they settle the dispute with a coin toss. A Clinton supporter correctly called 'heads' on a quarter flipped in the air, and Clinton received a fifth delegate." Could this happen again this year? It's pretty unlikely, but not impossible. Again, as Taylor reports, seemingly unusual tiebreak methods are not new in politics. According to the National Council of State Legislatures, Wyoming uses coin tosses to break ties. Last year in Mississippi, the winner of a seat in the state Legislature was determined by drawing straws. Brett Neely also contributed to this report.